Sorry about this, I've been reading Derrida. So you were won over by the dazzling good looks and cutting-edge high tech of the Pelvin D-Lux? Then you'll want to join Angelina and get a [temporary] Pelvin tattoo! Yes, they exist already, and I've got four of them to give away. In order to get one, you just have to be one of the first four people to comment on this post with something a tough typospherian might say. We tattooed people are tough, after all. Here's a lovely advertising insert from a vintage Pelikan typewriter ribbon. (Thanks to Bill M for the tip on it!) 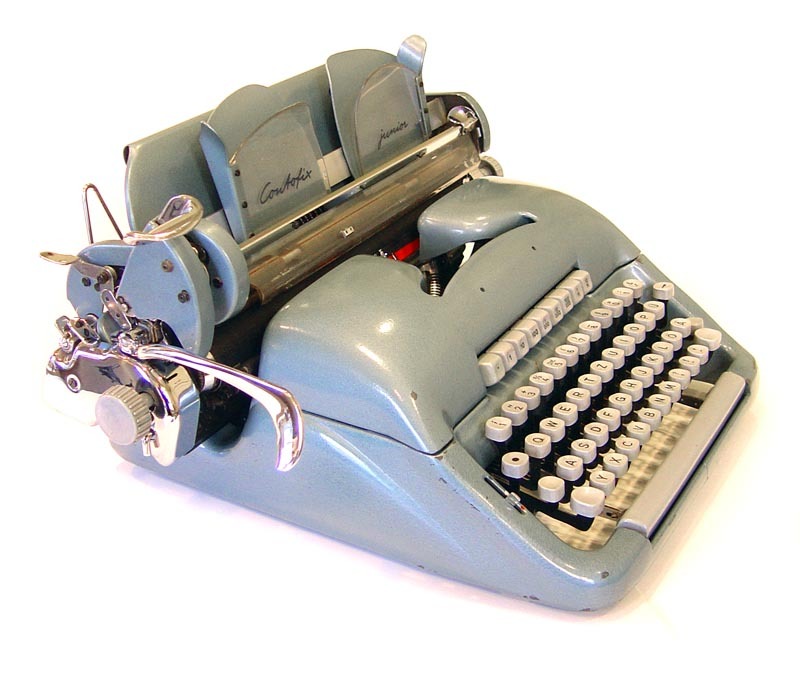 What a luscious product: a bakelite round box with a golden top that unscrews, embossed with the Pelikan logo; a metal Olivetti spool wrapped in foil, again with the logo; a clever uninked end of the silk ribbon; and best of all, this fanfold advertising. Unwrapping this ribbon was like unwrapping gourmet chocolate. I would guess that this dates from the early '60s; how about you? After typing this, I read up a bit on the Marshall Plan, and it seems that many today argue that it should not be given too much credit for the Wirtschaftswunder. 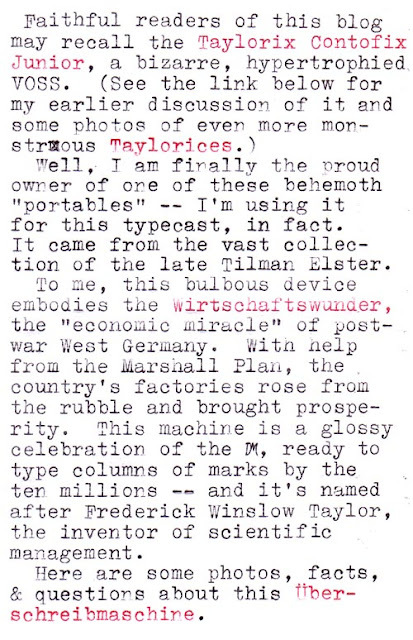 Here is some information on Frederick Winslow Taylor, whose theories seem to have inspired the Taylorix company to develop its bookkeeping systems and invent typewriter attachments to help with keeping business records. ... and the whole exterior shell! This striptease is fairly easy on a late Voss, which allows you to remove its exoskeleton without any tools, just unhooking some hooks and doing a little typewriter wrestling. Here's the attachment. 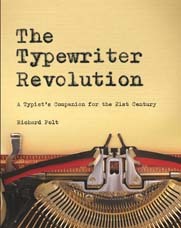 Its purpose seems to be to feed forms, possibly fanfold forms, through the typewriter, and to allow you to read them easily as you are filling them out. Here's a rear view of the Contofix with its clothes back on and its formfeed attachment on. The paper slides into two adjustable paper holders. When you push down on the large lever on the left side of the attachment, it quickly pulls the paper through the rollers that are directly beneath the paper holders. It is then possible to feed the paper into the front of the platen. Is this what you're supposed to do? I'm not 100% sure. The machine is ready for typing. 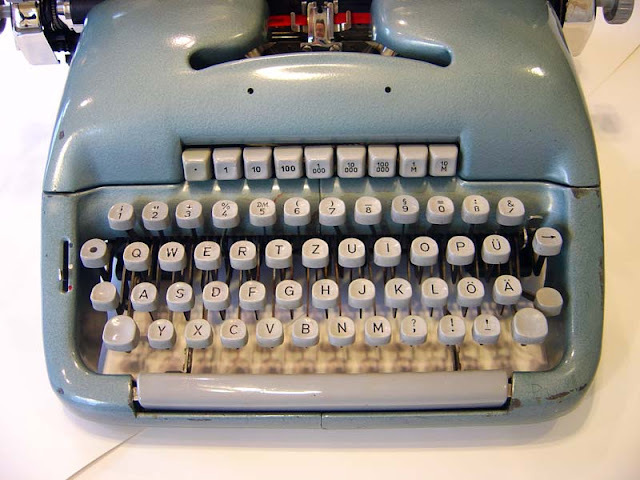 Typing, in this position, is noisy because the paper isn't flat against the platen and it makes popping sounds as you type. Every time you return the carriage, the paper is pulled up a bit farther into the formfeed attachment. You can push the long horizontal plastic shield down, presumably for better visibility. But why do you need the shield in the first place? Now here's a complication. With the formfeed attachment off, you can see that if you lift up the erasing table (not possible on a normal Voss), you reveal little metal feed rollers, suggesting that the paper is meant to pass through there. But why? I can't figure out a paper path that uses all the features of the carriage and the formfeed attachment. Probably the typewriter was intended for two different uses. If I had the forms they were using, I might understand better. 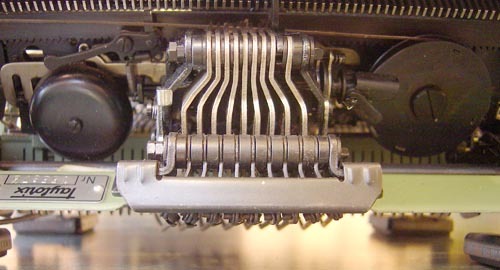 ... when you press it down it locks in position , extending a spring (the big spring on the right in the photo below) that helps to pull the carriage upwards. Without the spring, the weight of the formfeed attachment makes shifting far too difficult. 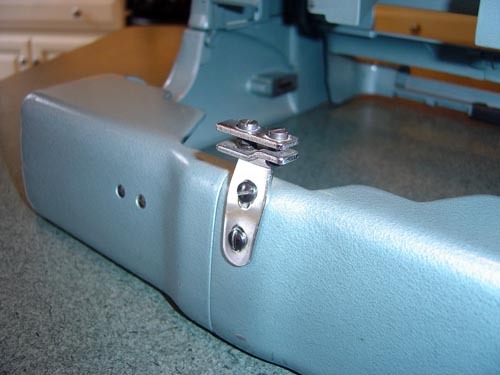 But when you don't have the attachment on, you want to release the spring (pulling forward on the metal tab to the right of the /& key) -- otherwise the carriage will stick in the upper position. You can see that you want the figures to line up on the decimal point. You set your tab stops at the decimal points, and then hit the tabulator key appropriate to the figure you want to enter. For instance, if you want to enter 456.87 you will hit the "100" tab key, and the tabulator will take the carriage to a spot three spaces before the decimal point. A mystery on this typewriter is that the "." tab key does not stop the carriage at all -- the carriage just ignores all tab stops and moves all the way from right to left. I assumed something was broken, but when I inspected the mechanism it appeared to be designed to work this way. 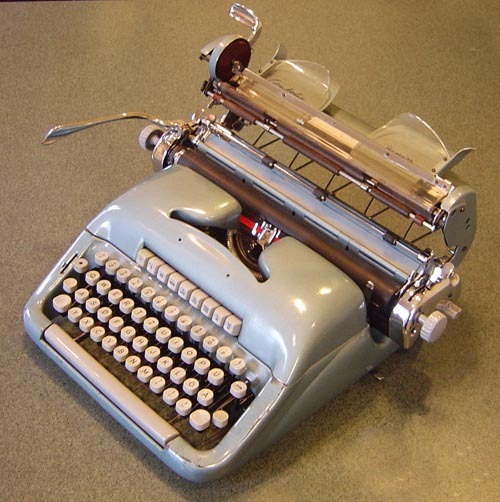 Finally, one more mystery: the purpose of this attachment on the back of the typewriter shell. Clearly I have more things to learn about the Taylorix Contofix Junior! 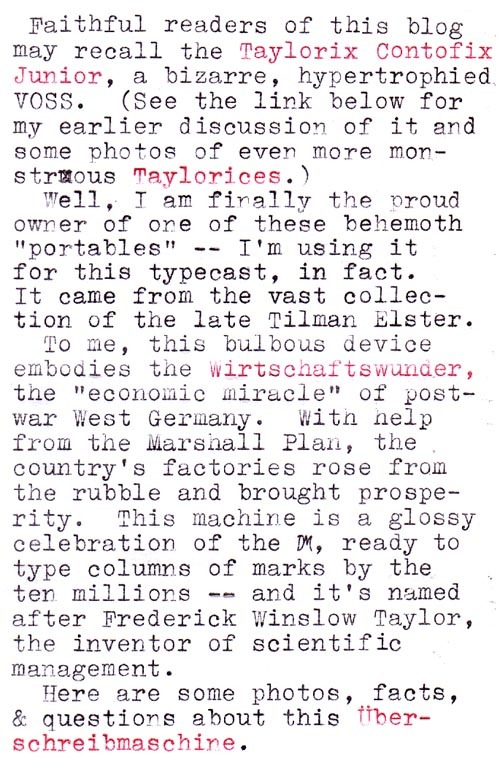 PS: I mean the model of the typewriter pictured in the tattoo, not the one I used to write the typecast (which was, incidentally, an R.C. Allen VisOmatic). Read about '50s Underwoods on Alan Seaver's site and Robert Messenger's blog. Read about designer Paul A. Braginetz on Robert Messenger's blog. And here's the black-and-white version of this machine. 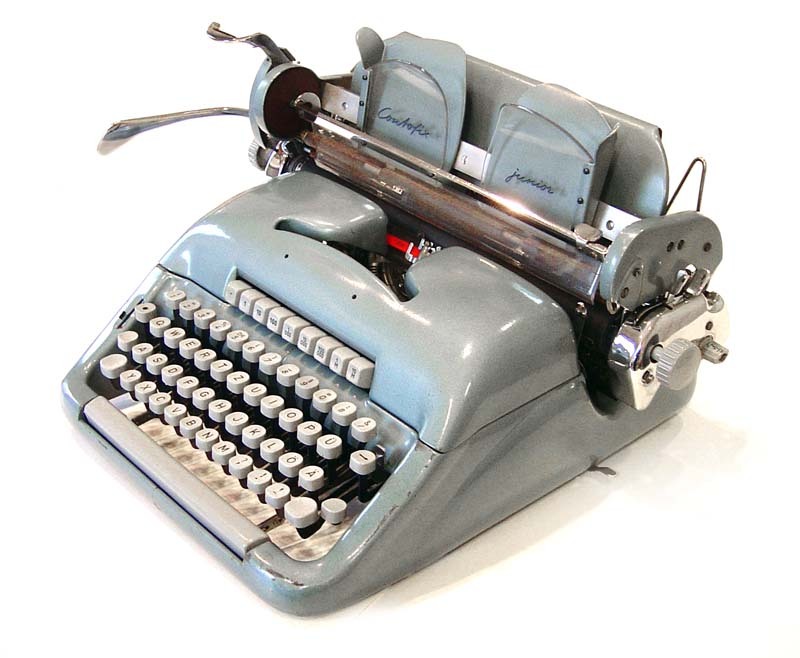 I also recently bought several rare typewriters that will turn up on this blog sooner or later. Hmm, where did that come from? 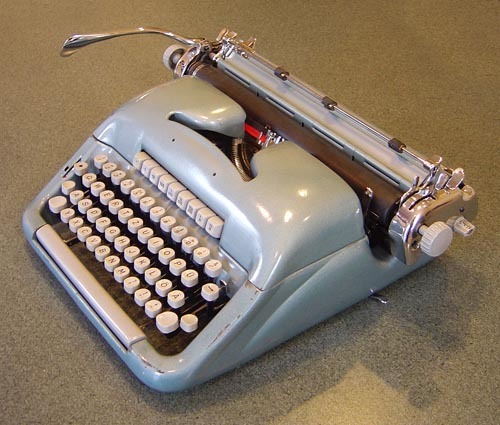 On a happier note, I stopped by St. Vincent de Paul's and picked up an Olivetti Lettera 33 for three bucks! PS: Thanks to Bill M for sending me a replacement knob for my Royal! PPS: This is what a Noiseless (not Remington/Underwood Noiseless) Portable looks like, for those who aren't familiar with it. Mine isn't working terribly well, unfortunately.